There are over 100 types of arthritis classified in various forms. For effective treatment, we classify them into 4 groups. 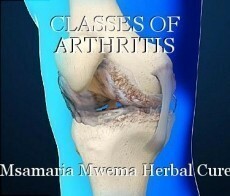 Arthritis is not a disease but rather an informal way of referring to the various joint pains. There are over 100 joint conditions that manifest by pain, but for study purposes they can all be grouped into 5 forms. ASTEOARTHRITIS which involves wear-and-tear of joints due to overuse, RHEUMATOID where body cells attack the body/autoimmune disease, FIBROMYALGIA which results from tender joints and exaggerated interpretation of pain by the brain, LUPUS which is also an autoimmune disease and GOUT which results from uric acid accumulation in the body. But, for treatment purposes MMHCI groups these over 100 conditions into four classes: 1. Metabolic arthritis -eg, gout, 2. Degenerative arthritis -eg osteoarthritis and fibromyalgia, 3. Inflammatory arthritis -eg Lupus where the body's owm immunity attacks the joints. 4. Infectious arthritis caused when bacteria , viruses, fungi infect joints. This approach has made it very easy to treat various manifestations of arthritis. You can also find us on facebook. Which gift is the best choice to send to our mothers? This page was created in 0.4818 seconds.